The centre is in Beijiaochang Road which is surrounded by banks, hotels, supermarket and restaurants which can provide all the thing you need in working day. The centre provides completed facilities such as business smart phone; broadband, printing /copy / fax machine, refrigerator, water dispenser, furniture’s, air conditioning, 24 hour access, 24 hour security, shared internet, training room and access control attendance. The centre located in the centre of Guangzhou City. The centre is surrounded by banks, hotels and restaurants for your daily needs. The centre provides completed facilities such as business smart phone; broadband, printing /copy / fax machine, refrigerator, water dispenser, furniture’s, air conditioning, 24 hour access, 24 hour security, shared internet, training room and access control attendance. The centres is in the city centre. The centre is a Grade A office building which providing a nice working environment. The centre provides completed facilities such as business smart phone; broadband, printing /copy / fax machine, refrigerator, water dispenser, furniture’s, air conditioning, 24 hour access, 24 hour security, shared internet, training room and access control attendance. The centre is surrounded by banks, hotels and supermarket which can provide all you need in working day. The centre is at East of Pazhou Avenue, Haizhu District. You can easily access to the centre by subway line 8 at Pazhou or by bus. There is just 10 minutes walking distance to the subway and 3 minutes walking distance to the bus station. The centre provides multi-functional conference room, leisure negotiation area, pantry, sky garden and other public areas with furniture, water and electricity, air conditioning, coffee & tea, cleaning and security services for your daily office use. The centre is in East Xingang Road, Zhuhai District. The centre closes to Guangzhou International Convention and Exhibition Center. You can easily come to the centre by Metro 8 or by bus (14, 53, 69, 80, 93, 184, 864, 967, 968). The centre is surrounded by commercial buildings, parking lot and restaurant. The centre provides private office, hot desk, front desk, meeting room, open area, mini kitchen, event venue, café and game room for your daily office use. The centre is in Fenghe Road, Baiyun District. The centre is near to the Baiyun international airport. The centre is surrounded by restaurants, hotel and shopping mall. You can easily access to the centre by Metro 3,9 or by bus 737, 701, 704, 707, 711, 715 or 750. The centre provides private office, hot desk, front desk, meeting room, open area, mini kitchen, event venue, phone box, café and reading corner for your daily office use. The centre is in Guangzhou Avenue, Yuexiu District. You can easily access to the centre by subway Metro 5 or by bus. This is just 3 minutes walking distance to the bus station. The centre is surrounded by hotels, parking lot, commercial buildings, commercial plaza and restaurants. The centre provides private office, hot desk, front desk, meeting room, open area, mini kitchen, event venue, café and game room. The centre is in Hai'an Road, Tianhe District. The centre is a grade A office building. You can easily access to the centre by Metro 5 or by bus (137, 138, 243, 278, 284 or 302). The centre provides private office, hot desk, front desk, meeting room, open area, mini kitchen, event venue, café and game room. The centre is surrounded by hotels and lots of commercial building which provide a strong business environment. Set in an up-market mixed-use complex, which is also home to world-class hotels, upscale retail and residential apartments, this stylish serviced office centre offers a variety of office suites, along with a superb selection of business support services. This business address is conveniently located close to public transport links. 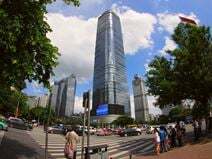 The centre is in Huaming Road, Tianhe District, it is in the CBD area. The centre provides completed facilities such as business smart phone; broadband, printing /copy / fax machine, refrigerator, water dispenser, furniture, air conditioning, 24 hour access, 24 hour security, shared internet, training room and access control attendance. The centre is surrounded by comfortable hotels, banks, restaurants and supermarket which provide a great access for your working day. The centre is in Huangpu Boulevard West, Tianhe District. It is located in the CBD area. The centre is surrounded by hotels, supermarket, banks and restaurants. The centre provides completed facilities such as business smart phone; broadband, printing /copy / fax machine, refrigerator, water dispenser, furniture, air conditioning, 24 hour access, 24 hour security, shared internet, training room and access control attendance. Part of a large integrated development, this modern office tower is ideally situated amongst the hustle and bustle of the city. Offers fully furnished executive suites and open plan workspace as well as a meeting rooms and a business lounge. 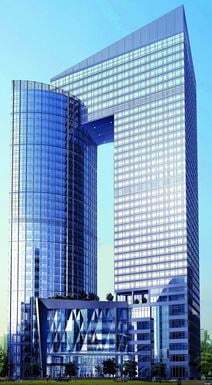 The centre located in a Grade A office building in Huaxia Road, Guangzhou's central business district. You can easily access to the centre by metro (3 or 5) or by bus (40, 90, 194, 777 or 778). The centre provides private office, hot desk, front desk, meeting room, open area, mini kitchen, event venue, café and game room. The centre is surrounded by famous hotels, banks, parking lot and many commercial buildings which provide a strong business environment. The centre located in the golden section of Beijing Road. The centre is near the subway station in front of the park. The centre provides completed facilities such as business smart phone; broadband, printing /copy / fax machine, refrigerator, water dispenser, furniture’s, air conditioning, 24 hour access, 24 hour security, shared internet, training room and access control attendance. The centre is surrounded by banks, hotels and restaurants for your daily uses. The centre is in Huanshi City which is a very strong business district area and great for business. The centre provides completed facilities such as business smart phone; broadband, printing /copy / fax machine, refrigerator, water dispenser, furniture’s, air conditioning, 24 hour access, 24 hour security, shared internet, training room and access control attendance. The centre is surrounded by banks, hotels and supermarkets. 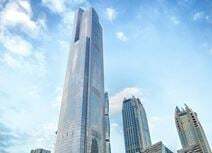 Located in the heart of the Zhujiang New Central Business District in Guangzhou, this centre sits on the 17th floor of an international Grade A-rated office tower. Flexible terms mean you can choose between a coworking desk or a private office, and upgrade at any time. This business center is strategically situated in a mixed-use building, meaning that there are plenty of amenities right on-site. With serviced apartments and a high-end shopping mall within the building there are plenty of options for you to choose from. The building is also located within walking distance of some of the most prestigious locations in the city. The centre is in Jinsui Road, Tianhe District. The business atmosphere is strong in this area. The centre provides completed facilities such as business smart phone; broadband, printing /copy / fax machine, refrigerator, water dispenser, furniture’s, air conditioning, 24 hour access, 24 hour security, shared internet, training room and access control attendance. The centre is surrounded by banks, restaurants, business centre and drugstore for your daily uses. The centre provides completed facilities such as business smart phone; broadband, printing /copy / fax machine, refrigerator, water dispenser, furniture’s, air conditioning, 24 hour access, 24 hour security, shared internet, training room and access control attendance. The center has set up a temporary reception visitor area for the user. The centre located in Keyun North Road and it is surrounded by banks, hotels and restaurants. This high-quality business centre provides professional support services, meeting rooms, a video conferencing room, two quality coffee areas, professional secretarial and administrative services and IT support. The centre is located in Guangzhou's CBD. There is a shopping mall, restaurants and a car park nearby, on Linhexi Road, Tianhe District. This is adjacent to Guangzhou Train Station (East), and there is easy access to subway and bus station. Fully furnished and spacious office suites, with a unique, modern design located in Guangzhou. Features of the centre include executive facilities, high quality communications infrastructure and professional business support services. This is a mixed use complex, combining the five-star Westin Hotel with premium office space. 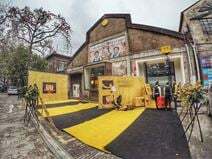 It is located on Linhe Zhong Road, in the Tianhe CBD of Guangzhou, opposite the eastern railway station's Green Plaza. The centre provides completed facilities such as business smart phone; broadband, printing /copy / fax machine, refrigerator, water dispenser, furniture’s, air conditioning, 24 hour access, 24 hour security, shared internet, training room and access control attendance. The centre is surrounded by a diverse range of shopping malls, schools, banks, hotels and restaurants which can provide your lots of lunch options. The centre is located in Nonglinxia Road, GuangZhou which is surrounded by banks, hotels, restaurants, University and department store. The centre provides completed facilities such as business smart phone; broadband, printing /copy / fax machine, refrigerator, water dispenser, furniture’s, air conditioning, 24 hour access, 24 hour security, shared internet, training room and access control attendance for your office daily use. The centre is at the intersection of Dongfeng West Road and Renmin North Road. The centre is near Guangzhou International Economic and Trade Building and Guangzhou International Finance Building. The centre provides completed facilities such as business smart phone; broadband, printing /copy / fax machine, refrigerator, water dispenser, furniture’s, air conditioning, 24 hour access, 24 hour security, shared internet, training room and access control attendance. Attracting numerous well-known companies like Wechat, Mo & Co, and many more the T.I.T creative park is a great place to grow your business. This centre provides high-end office space in the park and designed to help start-ups, SMEs and MNCs across all industries. Just an eight-minute walk from the Kecun Metro Station(Line 3 & 8). The centre provides completed facilities such as business smart phone; broadband, printing /copy / fax machine, refrigerator, water dispenser, furniture’s, air conditioning, 24 hour access, 24 hour security, shared internet, training room and access control attendance. The centre is in Shuiyin Road and it has convenient transportation. The centre is surrounded by banks, hotels, supermarket and restaurants. These offices are located in the centre of Guangzhou Municipality. Features include state of the art technology infrastructure, and conference rooms for 8 to 200 people. 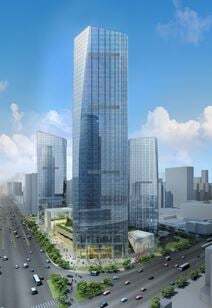 The building is near Metro lines 1 and 3, and it is five minutes’ away from Guangzhou East Railway Station and 30 minutes’ away from the international airport. The centre provides completed facilities such as business smart phone; broadband, printing /copy / fax machine, refrigerator, water dispenser, furniture’s, air conditioning, 24 hour access, 24 hour security, shared internet, training room and access control attendance. The centre located in the West Section of Longkou West, Tianhe North. The centre is surrounded by banks, hotels and restaurants which can provide your lots of lunch options. Offices to let in the heart of Guangzhou's best-known CBD. It provides flexible contract terms on fully equipped and beautifully furnished office space, and there is a professional, bilingual receptionist to answer your calls. There are also meeting rooms, video conferencing facilities, a data projector, conferencing phones, flipcharts and catering available on request. Stations for Metro lines 1 and 3 are just nearby, and the bus station is 10 minutes’ away on foot, allowing access to an airport express bus, and over 20 city bus routes. With an impressive tenant list, world-leading design and superb management, this centre provides serviced offices with an emphasis on Green technologies. Hotels, eateries and retail are nearby, and good transport links are plentiful. 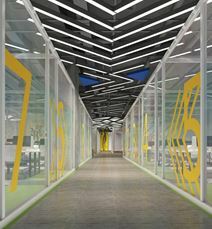 With 360° spectacular views this flexible workspace is located in the heart of CBD in Guangzhou. As well as providing premium office spaces, the on-site management team are able to help with the running of your business. The centre provides completed facilities such as business smart phone; broadband, printing /copy / fax machine, refrigerator, water dispenser, furniture’s, air conditioning, 24 hour access, 24 hour security, shared internet, training room and access control attendance. The centre located in the Shijiagangding section of Tianhe District which is near Exit A of Metro Gangding Station on Line 3. The centre is surrounded by banks, hotels and restaurants. The centre provides completed facilities such as business smart phone; broadband, printing /copy / fax machine, refrigerator, water dispenser, furniture’s, air conditioning, 24 hour access, 24 hour security, shared internet, training room and access control attendance. The centre has set up a temporary reception area for members. The centre is surrounded by banks, hotels and restaurants which can provide your lots of lunch options. 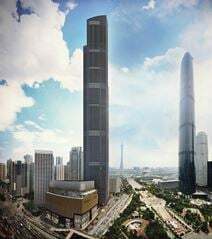 The centre is in Tianhe Road, Guangzhou city. he centre provides completed facilities such as business smart phone; broadband, printing /copy / fax machine, refrigerator, water dispenser, furniture’s, air conditioning, 24 hour access, 24 hour security, shared internet, training room and access control attendance. The centre is surrounded by supermarket, shopping mall, comfortable hotels,restaurants, banks and parking lots for your daily uses. The centre is in Tiyu Dong Road, Tianhe District. The centre provides completed facilities such as business smart phone; broadband, printing /copy / fax machine, refrigerator, water dispenser, furniture, air conditioning, 24 hour access, 24 hour security, shared internet, training room and access control attendance. The centre is surrounded by comfortable hotels, banks, restaurants and supermarket which provide you a great access on your working day. The centre is in Tiyu Xi Road, Tianhe District. The centre is surrounded by comfortable hotels, banks, restaurants and department store which providing a great access for your working day. The centre provides completed facilities such as business smart phone; broadband, printing /copy / fax machine, refrigerator, water dispenser, furniture, air conditioning, 24 hour access, 24 hour security, shared internet and training room. The centre is in Tiyu Xi Road, Tianhe District. The centre provides completed facilities such as business smart phone; broadband, printing /copy / fax machine, refrigerator, water dispenser, furniture, air conditioning, 24 hour access, 24 hour security, shared internet, training room and access control attendance. The centre is surrounded by sports center parking lot, banks, middle school, department store and restaurants. Office space prices ranging from ¥585 - ¥13160 per month. East meets West in the interior design of this superb modern serviced office facility. Breathtaking views, a good range of support services, and a prestigious corporate environment combine to make this an ideal setting for modern day business. This centre is close to a range of well known buildings including Times Square Plaza and China Mayor Tower. Situated on the 25th floor, this centre offers excellent serviced office accommodation with a range of business support services. This quality business centre is situated on the 21st floor of an international Grade A commercial landmark. The development offers business club, panorama hall and luxury hotels. Excellent connections to the citys public transport network. The centre is in Xiancun Road, Tianhe District. The centre is surrounded by comfortable hotels, banks, restaurants, banks and supermarket which provide a great access for your needs on working days. The centre provides completed facilities such as business smart phone; broadband, printing /copy / fax machine, refrigerator, water dispenser, furniture’s, air conditioning, 24 hour access, 24 hour security, shared internet, training room and access control attendance. This business centre is situated on the eighth floor of a building in a prime location, close to business and commercial amenities and easy to reach from across the city. This mixed-use development offers a range of workspace solutions to suit your business needs. Just Announced - The centre is in Yanjiang Middle Road. You can easily come to the centre by train at Tuanyida Station or by bus. There is just few minutes walk to the train and bus station. The centre provides phone booths for conducting private calls and video chats, fruit water to keep you hydrated, meeting rooms for you to hold a meeting, cleaning services to tidy up your work place and social event for you to join so you can meet up with your coworkers. The centre is in Yuejiang Road, Zhuhai District. The centre is located at the center of Pazhou. You can easily access to the centre by Metro 4, 8 or by bus 137, 229, 262, 564, 762 or 66. The centre is surrounded by restaurants, shopping mall, police station and gardens. The centre provides private office, hot desk, front desk, meeting room, open area, mini kitchen, event venue, café and game room for your daily office use. Located right above a Metro station this central Yuexiu District modern 26-storey office tower is ideally positioned and offers views over the city from the fully furnished and equipped office space. The area is known as a hub for administrative and financial companies making this space ideal for any businesses in those industries. Opening February - Occupying multiple floors of this Zhongshan 5th Road building, this brand new centre is ready to accommodate your business and provide a new and exciting experience. Access printer, copier and scanning facilities, a variety of working environments from a classroom to conference rooms to phone booths, with coffee machines in the pantry, a community bar with beer taps, a mother's room, and a rooftop to socialise with others. 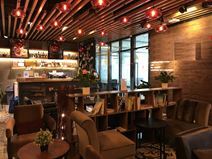 Primely located near a shopping mall and Gongyuanqian Station, this centre also provides access to a variety of food and beverage facilities, retail venues, and financial institutions. The centre provides completed facilities such as business smart phone; broadband, printing /copy / fax machine, refrigerator, water dispenser, furniture’s, air conditioning, 24 hour access, 24 hour security, shared internet, training room and access control attendance. The centre is in Guangzhou Ferris which is surrounded by banks,supermarket, hotels and restaurants. This is a great location for business use. 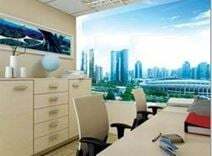 Located near the Pearl River and conveniently placed for all transportation links, this high-end office space offers excellent workspaces for companies of all sizes. Newly opened for 2018, the provider believes that bringing your workplace to life enriches your environment for the better. A number of luxurious hotels line nearby streets, which is ideal for if you work on the go, or if you have clients coming to visit. 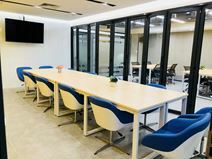 Situated in the heart of Zhujiang Newtown Business District this state-of-the-art serviced office space is on the 9th floor and provides direct links to the Metro and Airport Express. Very well connected to public transportation the centre is located in the Finance Centre of Zhujiang which offers a beautiful view of the city in all directions. Surrounded by five-star hotels, different types of restaurants and shopping malls the centre is in a prime location. They offer full service operational support, expert IT support and a 24/7 access to the building. The centre is in Zhujiang East Road, Tianhe District. The centre is a brand new 5A grade office building. The centre provides completed facilities such as business smart phone; broadband, printing /copy / fax machine, refrigerator, water dispenser, furniture, air conditioning, 24 hour access, 24 hour security, shared internet, training room and access control attendance. The centre is surrounded by hotels, banks, restaurants, banks and supermarket which provide a great access for your working day. This stunning office building has floor-to-ceiling windows that provide views over the CBD including Caton Tower. The 34th floor centre provides fashionably furnished spaces while it"s location as an international meeting centre means that conferences for up to 280 people are no problem at all. With breathtaking views, an impressive list of tenants and a superb location, this centre has everything your business needs to grow. Set in one of the tallest buildings in the world, this is an award-winning business opportunity. Transport links are plentiful.